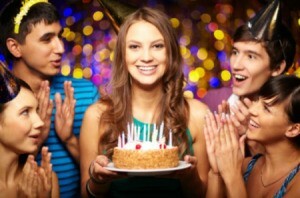 Planning a birthday party, especially a girl's sweet 16th, is a fun, exciting activity, that is sometimes also daunting. This is a guide about 16th birthday party ideas for girls. I agree with the previous post - have a BBQ! You could set up a "Sundae Bar" for the ice cream with all kinds of toppings - YUM! And a burger bar with toppings. Set up some activities for your friends, like volleyball or even a sprinkler - you know, even if you are 16, people of all ages enjoy "letting go" a little. Maybe have a theme - Mad Men, Hawaii, 70's tie dye, whatever is cool to you and your friends - ask some of them what they'd like. Most of all, make sure you have fun! Hey, how about karaoke?! Yeah, it's old, but it's still fun. I am turning 16 in March and I want to have a big party, but as of right now I can't think of a good theme for my party. I'm afraid anything I choose might be a disaster and I just can't decide. So if you have any good ideas I would love to hear them. Thank you. Because it's your party, you should choose a theme that you like. Whatever you are into right now is what you should do. Are you an artist? A dog lover? Are you crazy about fashion or a particular movie or sport? What kind of music do you like? The possibilities are endless. Maybe a costume party where everyone comes as their favorite movie star, for example. When my niece had her sweet 16, she was into fairies, so her party was themed in fairies! I always liked scavenger hunts. Make yours for charity. Divide your guests into groups. For example, Can have five groups of three or three groups of five. Give each group a 'shopping list'. They have to go to family and friends houses to find the stuff or can knock on other doors explaining what they are doing. List can be anything you might find in a grocery store, such as a can of tuna, packet of instant cereal, box of jello, nothing perishable. Tell the groups to tell the givers the food is going to your local food bank or mission. Then when get back to your house, you all can sort the items into bags. Then everyone can have cake and enjoy some music or a movie. I'm turning 16 in July my prom is also in July on the 15th, so I am having a prom theme party on the 22nd everyone thinks its a really good idea as they will get more wear out of their prom outfits :) if your not how about a theme maybe a fancy dress, or a themed fancy dress? Favorite celebs, singers, actors or Disney characters? I'm turning 16 at the end of this month and idk what to do. It's my first party where I can invite guys, but that can only happen if the party isn't at my house. My mom doesn't trust guys so she wants to do something that's cheap, but fun, where she doesn't have to clean up afterwards. I was thinking a pizza place with games singing, etc., or going to Santa Monica, bowling, or ice skating. I need help please and thank you. I am turning 16 May 24th and I was going to have a bonfire, but my mom said no, so now I am only having my 2 best friends over Kyle and Ashley and I have no idea what to do. We were planning to go to Seattle, but now we might go to Portland. Except I do not know what there even is to do over there. I need help and fast!